When we ended My Father’s World Adventures in December, I was faced with a choice. Go ahead and start My Father’s World ECC, or take a semester off from our regularly scheduled curriculum and put together my own studies for the kids. I was growing concerned with my oldest son’s reading level and his lack of interest in reading and writing. 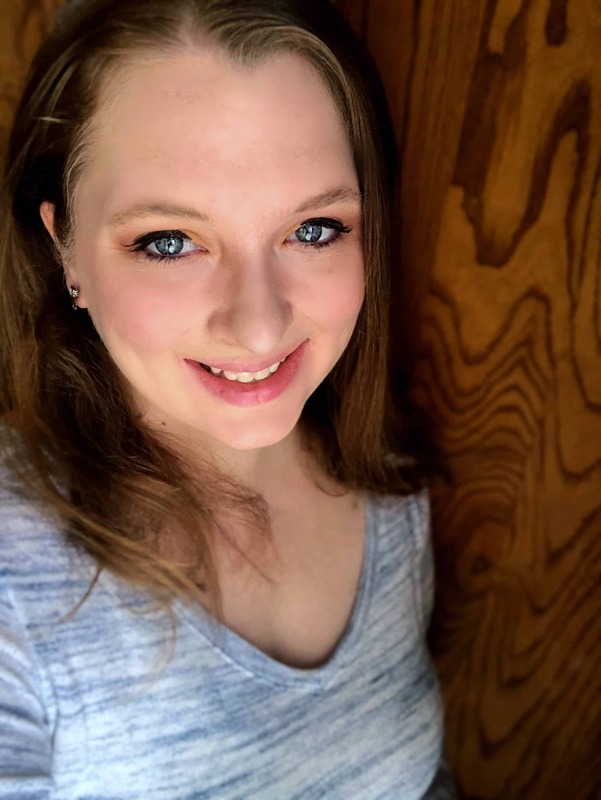 I knew I needed to change something, and that’s when I found The Good and the Beautiful homeschool curriculum. For the past three months we have been using The Good and the Beautiful with wonderful results. This semester has been a slower, interest-led, basics based curriculum for us, and I think it’s been a good move. 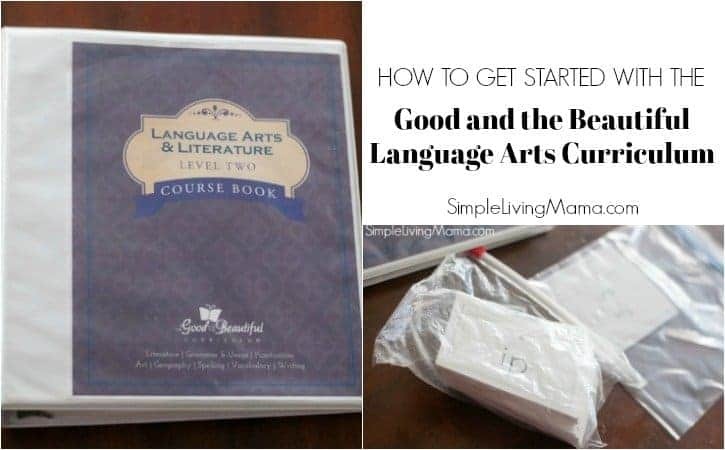 In this post I want to share with you our experience so far, and show you how to get started with The Good and the Beautiful Language Arts Curriculum. There are two ways to obtain this curriculum. You can purchase a physical set, or you can get it all for free and print your own copies. The Good and the Beautiful offers levels 1-5 are available as PDF downloads. I am using Level 2, and chose to use the free PDF. There are three components to this curriculum that you will need to print: the course book, the course companion, and the phonics cards. The same set of phonics cards is used in levels K-2, so if you had purchased the Level K program, or already used the Level 1 program, you will not need to reprint the phonics cards. If you do need to print the phonics cards, print them on card stock, so they will hold up better. The course book is over 300 pages in this level, so if you do not have a high quality printer, you will probably want to take it to an office supply store to have it printed. 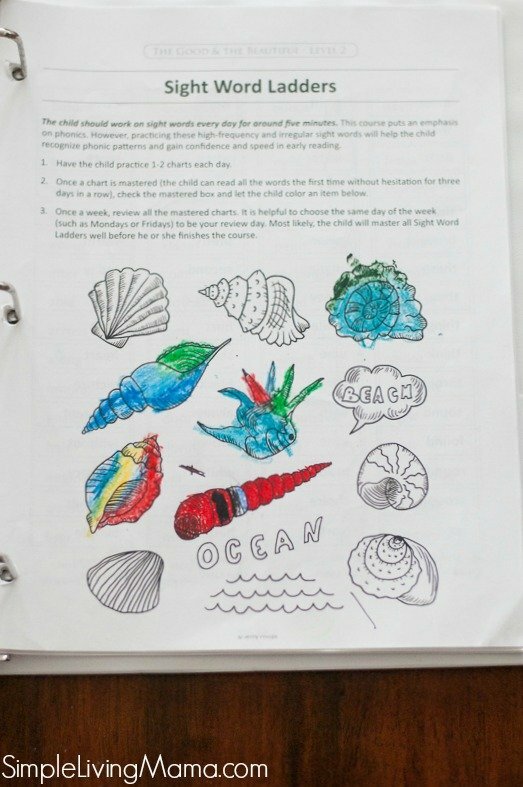 It is important that you print the course book in color because there is beautiful artwork that the child needs to see in color. Since I am a homeschool mom who likes to print a lot of our curriculum, I use an HP Laserjet Pro for my printing and it does really well. 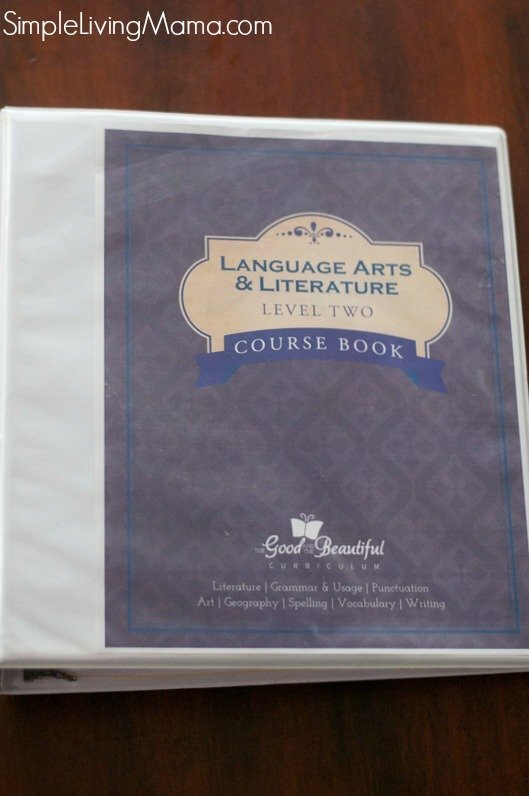 I wanted to keep the course book and the course companion in one binder, so I used my divider tab to easily flip to the course companion when we start language arts each day. A laminator is nice to have because you can laminate the daily checklist and keep it in the front pocket of the binder. 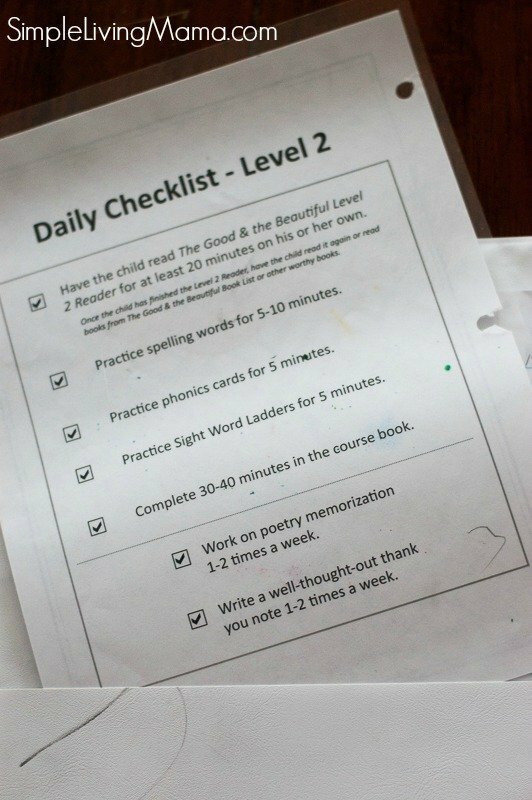 The daily checklist ensures your student knows exactly what work needs to be done each day. 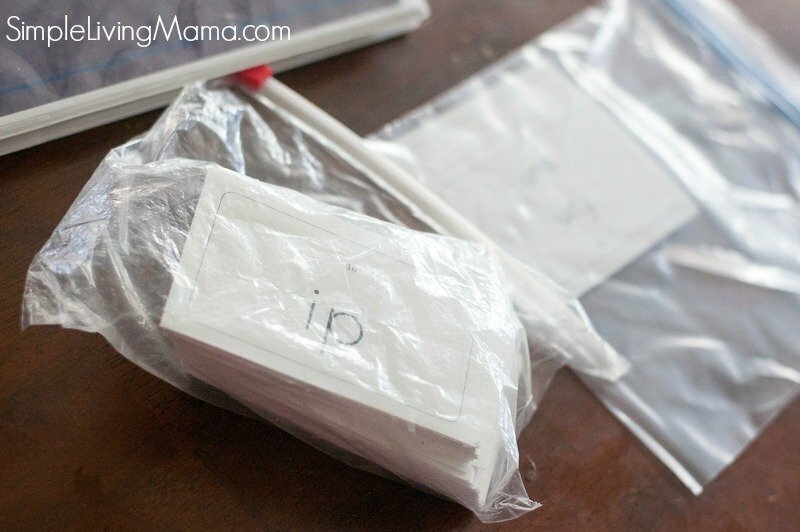 The Good and the Beautiful recommends three ziplock bags for the phonics cards. You’ll put cards the student has already mastered in one bag, learning in another, and all of the rest in the last bag. I absolutely love this curriculum. It combines phonics and reading, grammar, usage, and punctuation, literature, spelling, and writing, art, and geography. There is a placement test that allows you to choose the best level for your child. I decided to start my third grader in Level 2 because I could see he had some gaps in his reading and writing. Before starting this course, Bug hated reading lessons. I mean, there would sometimes be tears. Since we started this course, he actually enjoys it, and I have seen his progress. What I like about this open and go curriculum is that there are assessments that actually allow me to track what he knows, so I’m no longer just guessing and hoping for the best. The course companion includes these scheduled assessments. 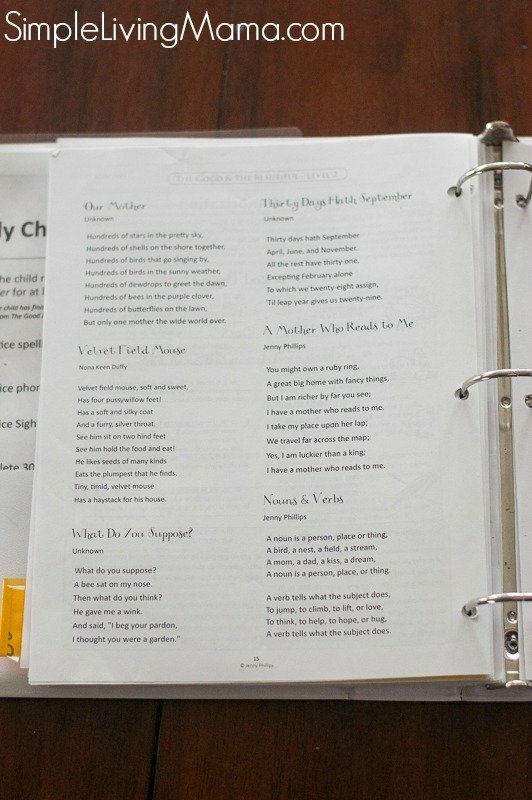 I am a sucker for poetry, and the Good and the Beautiful recommends having children memorize and recite poems. We have chosen a few beautiful selections from the course companion and we practice them during our Morning Time as a family. Bug is motivated to master his word ladders and spelling words because each time that he does, he gets to color something. This is a physical sign of his achievement, and I have found that is important to him. 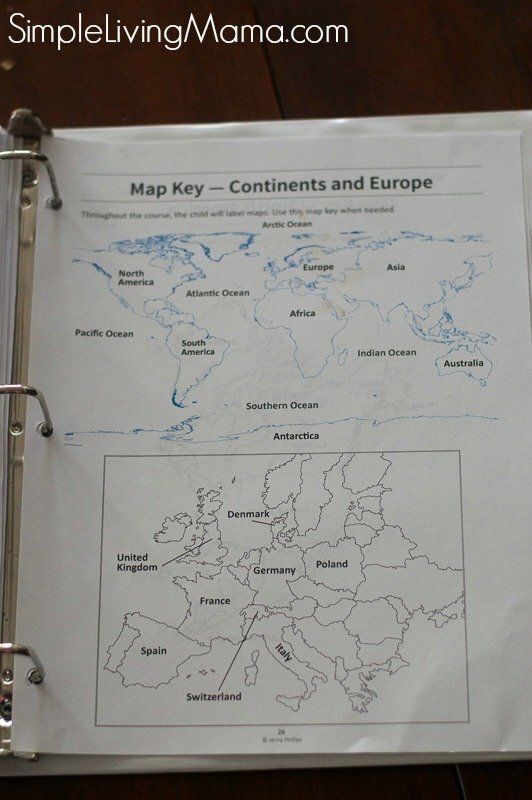 This sheet was not included in the curriculum, but the children are to learn the continents in this curriculum. It’s pretty cool that geography is included! 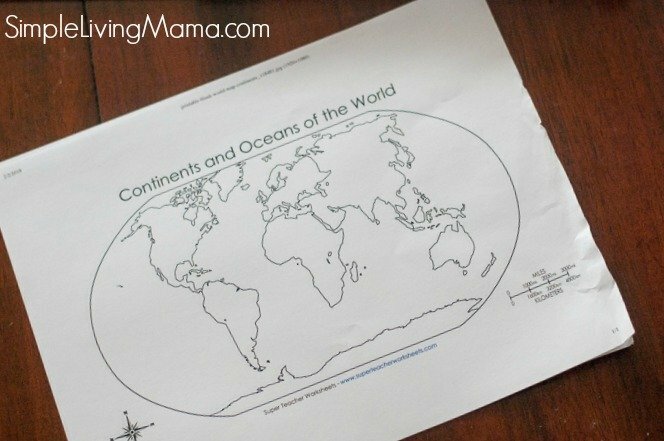 I decided to take that concept to our Morning Time as well, and do a map drill with the kids so the continents really stick with them. 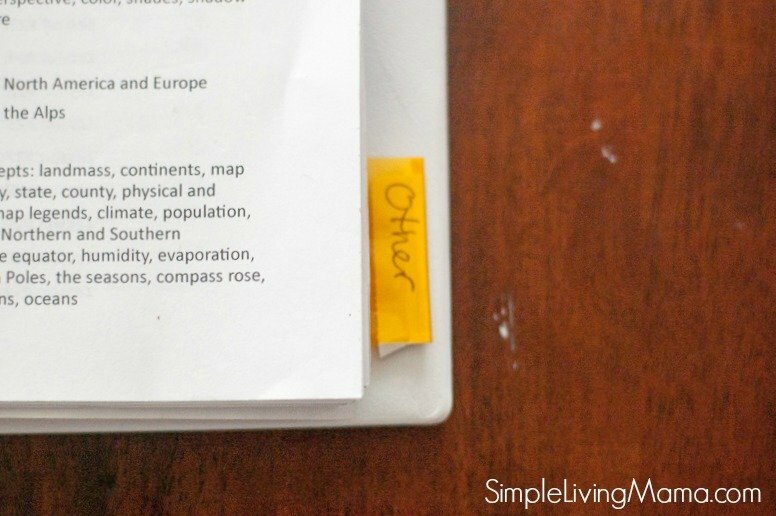 I will do this with the other areas of geography that we learn throughout this course. Here’s a look at the map key above for two of the areas of geography that we will study. I have honestly never been so pleased with a language arts curriculum. I actually LOOK FORWARD to doing this with Bug because it is truly good and beautiful, and he likes it! 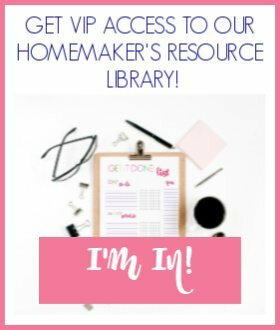 I also like that it is FREE, so it’s easy to decide whether or not it will work for your family before you make a purchase, and it’s less expensive than other curricula if you do decide it will work for your child! Learn more about the Good and the Beautiful Language Arts. Would you recomend getting it bound? I don’t really like having so many 3 ring binders laying around. Will you go back to MFW next semester? Yes, you can definitely have it bound. We will be going back to MFW, but I will continue with the Good and the Beautiful for language arts. May I ask why you will be going back to MFW? Will you use it through HS? Hi Traci! I have all of the MFW ECC curriculum already, so I’m planning to do an around the world study this coming school year. I am not going to be following MFW exactly as I have in the past and I’m going to add some other studies. I LOVE TGTB and I am switching all of my kids over to their LA and handwriting programs. We are adding some TGTB science units, too. Stay tuned because I’ll be showing all of it in the next month or so! How do I get it for free? I went on the sight and it is showing it costs! Levels 1-5 of the language arts curriculum are free! Just scroll down the page. Hello! I’m am not sure what faith you follow but I have read that the Good and the Beautiful is written by a a member of the LDS church. We are Lutheran, and I have some concerns over the content within this curriculum. 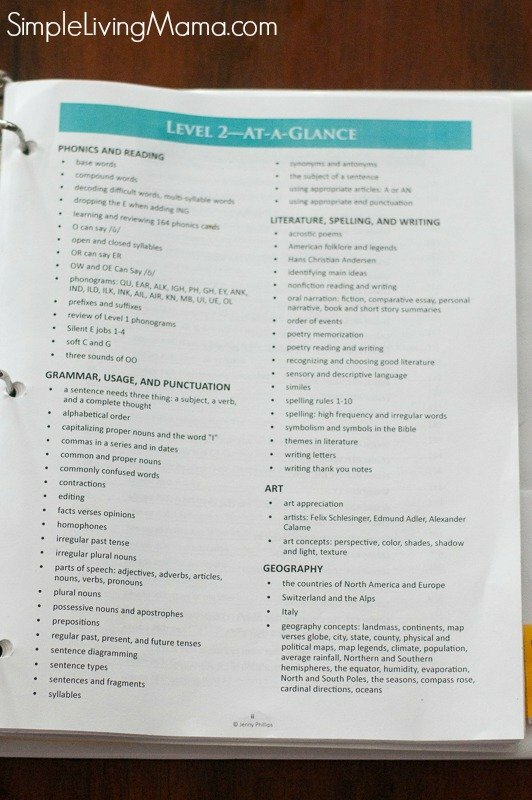 Do you think that this curriculum has a one sided LDS veiw or pushes any of its beliefs? We are currently using MFW and I feel like my kiddos are falling behind bc of this curriculum. Would you recommend it to a non-LDS family? Hi Taylor. I actually just found out about this controversy around the Good and the Beautiful last week. We are non-denominational, and I know the curriculum is written from a non-denominational viewpoint. I have been using the curriculum for a couple of months now and I would not know the author was LDS if I had not read about that in a forum, so I have not seen any evidence that it pushes LDS beliefs. I still feel like MFW is a good curriculum, but I definitely felt that my son was lacking in reading and writing. I know that MFW does not really ramp up the writing skills until the 4th grade, but the way this program is laid out not only helps me assess where he is, but he actually enjoys it. He did enjoy the short lessons in Language Lessons for Today, but I definitely felt he needed something more. I will continue on and use MFW ECC next year along with the Good and the Beautiful Language Arts, but I’m not sure if we will continue with MFW after that. I love that you are using the Good and the Beautiful!! We are going to be using it for LA, Handwriting, Science, and History starting next school year! I am in love with the curriculum and we can’t wait to get started! I have been using The Good and the Beautiful for three years. I liked it so much the first year that I bought the printed materials for the second year and added history in the third year. This program so far has been very non=denominational. I hope the denomination of the author wouldn’t prevent someone from trying it because it is simply based on works of literature and art which are “good and beautiful”. I do not follow the LDS religion and I am very careful not to use religious materials which have any particular slant (just the facts, please) and I haven’t found a fault with this curriculum.